MTO Transit Supportive Guidelines have been published. by municipal councils as part of the community’s official plan. developers to provide incentives for new riders. areas and impacts this will have on existing service levels. 2.2.2 Streets should be designed with sidewalks and crossings that are comfortable to use, with frequent intersections and crossing points that provide multiple routing options and amenities that enhance the experience of walking to and from transit. 2.2.3 The design of streets should help support the establishment of an extensive cycling network, creating safe and convenient streets for cyclists that are linked with transit, minimize conflicts between cyclists and other modes of transportation and contain amenities to support cycling. destinations are dispersed and vehicular speeds are high. to alert drivers of their existence and enhance user safety. a 3 to 5 km radius of a station area. 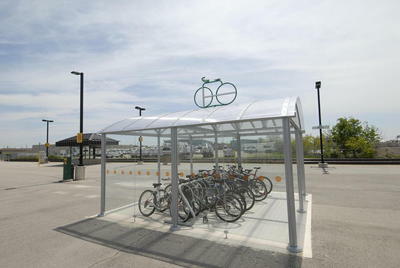 cyclists require infrastructure and facilities to enable them to safely move within a station area, minimize conflict with other vehicles and pedestrians and support them at both the beginning and end of a trip. used at the maximum load point. planning and consultation are still required to determine where resources are best spent and to ensure smooth implementation. transit systems is at least $10 billion/year. operating costs by about $5 billion/year. collisions by almost $2.5 billion/year. • transportation demand management requirements. increased walking, cycling and transit use.